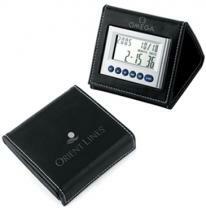 When traveling, set the local time in the large display and the time back home in the smaller display. Size: 2 3/4" x 2 3/4" Imprint: 2 1/4 " x 2" Packaging: Gift Box/battery included. Weight: 16 lbs. (100 pcs.). 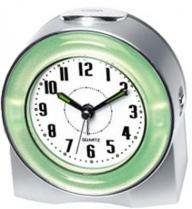 DISCONTINUED Plastic cover travel alarm clock. Batteries included. Individually boxed. Size: 2 1/4\" Diameter Max Imprint Area: 1 1/4\" Diameter. WT_100: 11 LBS. Paper-Proof: $10. (Required on all labels). 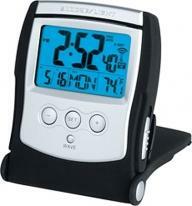 Travel alarm clock with sliding case and pop out stand. Size : 2.875"w x 2.1875"h WT/PC: 33 lbs./100 units (master carton) PACKAGING: Individually boxed. Batteries included. 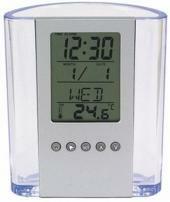 Time, temperature & humidity. Sweep second hand. Temperature. (C° & F°) Alarm. Includes: 1 AA battery. Pack/Weight: 40 PCS. / 20 LBS. Dimensions: 7 1/2"W x 3 1/4"H x 1 1/2"D Imprint Size: 2 3/4"W x 1/2"H Packaging: Individually Poly Bagged & Boxed. 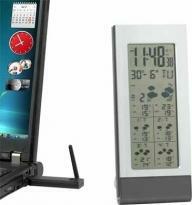 All ABS construction, large display time & date, tilt forward for lighted display. Finish/Material: Plastic Dimensions: 2 1/4" W x 3" H Imprint Area: 1 3/8" W x 1/2" H Shipping Information: Carton Size: Box Length: 38.50 Box Width: 18.10 Box Height: 39.00 Standard Packaging: Individually Carton Weight: 25 lbs. / 100 pcs. 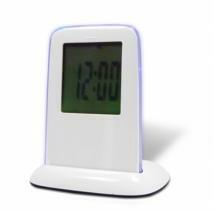 Compact "push" travel alarm clock, LCD display with blue LED back light, snooze function, easy time setting, 24 hour format. Push clock to view time. 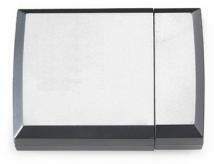 Aluminum case. Dimensions: 1 5/8" W x 2" H x 3/4" D Imprint Size: 1" W x 1" H Other decorating methods are available for this item, please call. Packaging: frosted Blue Square PVC box Carton Dimension: 15x10x5 Shipping Weight: 100 qty - 8 lbs. 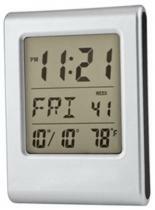 Attractive aluminum finish with charcoal gray accent, jumbo display clock with temperature, display year, month, day, and date, slim and lightweight, great for travel. Product Size: 3-1/8"H x 3-3/8"W x 1/4"D Imprint Area: outside cover: 1-1/2" h x 2-1/2"w. inside: 1/2"h x 1-1/4"w. Weight: 100pcs / 17lbs. Note: Price includes one color/one position silkscreen imprint Screen charge: $50 per color/position/style Repeat orders: $35 per color/position/style Less than minimum: add $75 per color/position/style For additional run charges and imprint details, call for details. 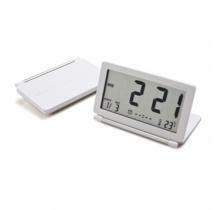 Jumbo display alarm clock with temperature, day, and date, Mini photo frame. Fits a 2" x 2-1/4" photograph. Matte silver with black accents. Product Size: 2-1/4"H x 3-1/4"W x 3/4" Imprint Area: Cover: 2""H x 2""W: Inside: 1/2""H x 1-3/4""W: Insert size 2""H x 2-1/4""W Note: Price includes one color/one position silkscreen imprint Screen charge: $50 per color/position/style Repeat orders: $35 per color/position/style Less than minimum: add $75 per color/position/style For additional run charges and imprint details, call for details. Weight: 100pcs / 21lbs. 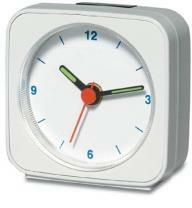 Square Travel Alarm Clock. Size: 2 1/4" x 2 1/4" Imprint: 2" x 2" Packaging: Gift Box/battery included. Weight: 5 lbs. (25 pcs.). 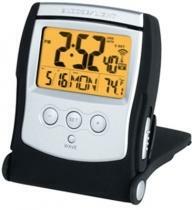 Slider: Slide up the magnifier with a LED light for reading, built-in LCD travel alarm clock *12/24 Hour Time Display Selection *Daily Alarm Clock *Hourly Chime Function *Month and Date *Magnifier with Light *3 Times Magnification *Operated by 3 x AAA batteries, catalog price include batteries, additional battery @$0.45 for 3 AAA batteries. Material: Plastic Product Dimensions: 4-5/8"H x 1-7/8"W x 3/4"D Imprint Dimensions: 1-3/8"H x 1-3/8"W Extra color/position imprint add $55.00 set up, plus running charge of $0.80 per piece for quantities of first two pricing columns, $0.40 per piece for quantities of last two pricing columns. Gift box and battery included. Packaging: Gift Box Units/Weight Per Carton: 100 pcs/20 lbs. Sleek and slim design. Bold color frame with black accent. 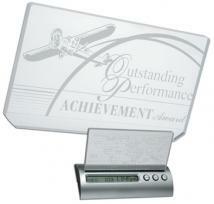 Large easy-to-read digital display. 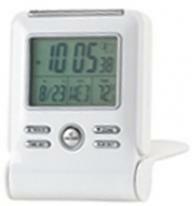 Includes time, day, week, timer, alarm and temperature. Built in stand. Great for travel. Product Size: 2-5/8"W x 3-1/2"H x 5/8"D Imprint Area: 5/16"h x 1-3/4"w. Note: Price includes one color/one position silkscreen imprint Screen charge: $50 per color/position/style Less than minimum: add $75 per color/position/style For additional run charges and imprint details, call for info. Weight: 100pcs/20lbs. Travel Alarm Clock. Size: 2 1/4" x 2 1/4" Imprint: 1 7/8" diam. Packaging: Gift Box/battery included. Weight: 5 lbs. (25 pcs.). 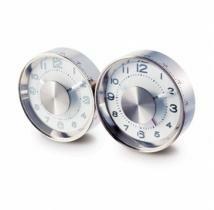 A polished chrome metal analog travel clock with an alarm. 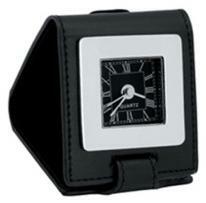 Open the case to reveal the clock and then snap it shut for easy traveling. Optional Free Laser Engraving included in the price. Includes a gift box. Material: Shiny Chrome Metal Size: 2 1/8"w x 2 5/8"h x 1"t Imprint Area: 1 1/2"w x 1 1/2"h Carton Size: 13" height x 15" width x 7" length Carton Weight: 22 lbs/100 pcs. 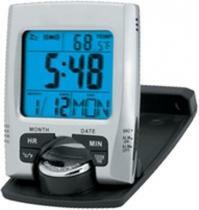 Analog Alarm Clock With Built In Flashlight. Size(s): 2-3/4 x 5-3/4 inch Imprint: 1 x 1 Additional Information: Pricing includes one color, one position imprint. 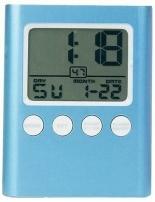 Unique Blue and Red Digital Screen. 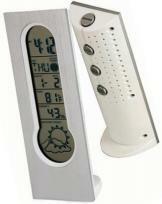 Features time, month, date, day and temperature, Lithium Battery Included. 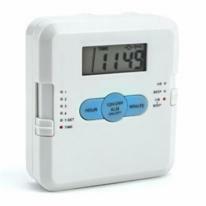 Functions Include Alarm with Snooze and Count Up/Down Timer. Product Size (H x W x D): 0.50 x 2.50 x 2.81 Imprint Area: Top 1"h x 1 3/4"w Packaging: Gift Box Pieces Per Box: 200 Weight Per Piece: 0.14 lbs. Weight Per Box: 27 lbs. Case Dimensions (L x W x H): 17 x 10 x 13. 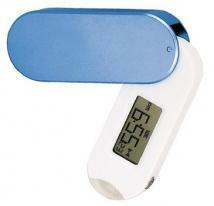 Rubber grip calendar/thermometer/Alarm clock Bright LED flash light. 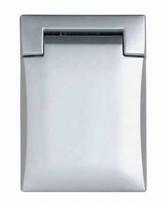 Size : 2 1/2" x 4 3/4" x 1" Imprint Area : 1 1/2" x 1 1/2" PCS/LB : 100/25. 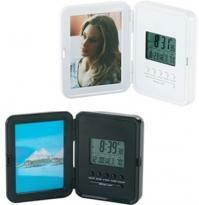 Foldable digital travel alarm clock with date. Size(s): 4 x 4 inch. Imprint: 3 x 2 1/2 Additional Information: Pricing includes one color, one position imprint. 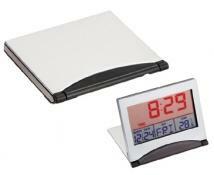 Foldable Calendar Alarm Clock. Size : 4" x 4" x 3/4" Imprint Area : 3" x 2 1/2" PCS/LB : 100/23. 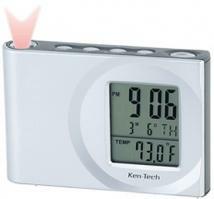 12/24 clock, alarm with 9 sounds, thermometer C/F, light/snooze function, universal calendar, matte silver ABS case, translucent accents. Finish/Material: Plastic Dimensions: 2 1/2" W x 3 1/2" H Imprint Area: 1 1/2" W x 1 1/2" H Standard Packaging: Individually Carton Weight: 37 lbs. / 180 pcs. 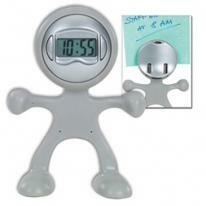 Silver plastic pop up dual time travel alarm clock with snooze. Size(s): 5 1/2" x 3 1/2" Imprint: 2 x 1. Additional Information: Prices include one color, one position imprint. 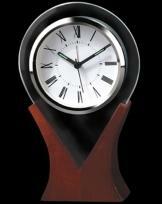 Silver and Wood Finish Travel Alarm or Desk Clock. Size(s): 4" x 5 1/2" Imprint: 2 1/2 x 3 1/2 Additional Information: Prices include one color, one position imprint. 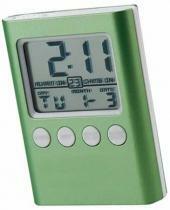 Delightfully eye-catching metallic color metal alarm clock with stop watch function. Product Size: 2 9/16" x 3 1/4" Imprint Size: 1 1/2" x 1/2". 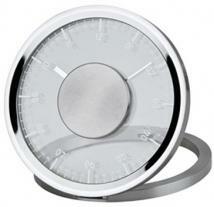 Penthouse : High Polish, all-metal flip open travel alarm clock, Inside surface of fold open panel is accented by felt. Item Dimension: 2 1/4"H x 2 3/4"W x 3/4"D Imprint Sizes: 1"H x 1 1/2"W Extra color/position imprint add 55.00 set up, plus running charge of 0.80 per piece for quantities of first two pricing columns, 0.40 per piece for quantities of last two pricing columns. Gift box and battery included. 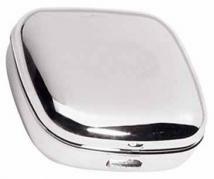 Packaging: Black Tuck-in Gift Box Material: Zinc Alloy Finish/Trim: Chrome Units/Weight Per Carton: 100 pcs / 46 Lbs. 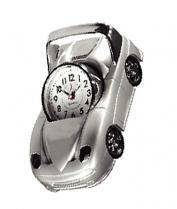 Car Shaped Small Alarm Clock. Size(s): 2 3/4 X 5 1/4 Imprint: 3/4 X 1/2 Additional Information: Prices include one color, one position imprint. 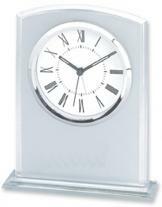 Glass Alarm Clock On Wood Base With Silver Trim. 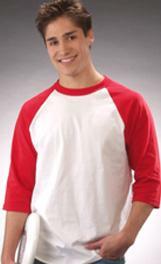 Size(s): 4 1/2 X 7 1/4 Imprint: 2 X 1 Additional Information: Prices include one color, one position imprint. 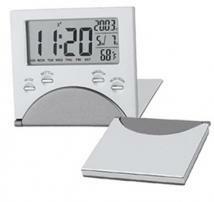 Rotary Display EL Back light Calendar & Thermometer. Size : 4" x 2 1/2" x 3/4". Imprint Area : 1 1/2" x 3/4" ; OPEN: 1/4" x 1 3/4". PCS/LB : 100/32. Battery : 1 x AAA (Included). 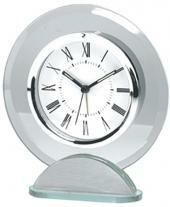 Round Silver And Glass Alarm Clock. Size(s): 4 3/4 x 5 1/2 Imprint: 1 1/2 x 1/2 Additional Information: Pricing includes one color, one position imprint. 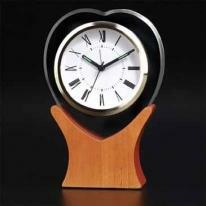 Heart Shaped Glass Alarm Clock With Wooden Base And Gold Accents. Size(s): 4 1/2 X 6 3/4 Imprint: 2 1/4 X 1 Additional Information: Prices include one color, one position imprint. 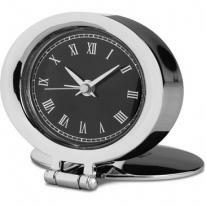 Rectangular silver & glass desk alarm clock. Size(s): 5" x 6-1/4" Imprint: 3 x 1 Additional Information: Pricing includes one color, one position imprint. Foldable analog travel alarm clock. Size(s): 3 1/4 x 2 3/4. Imprint: 2 x 2 Additional Information: Pricing includes one color, one position imprint. 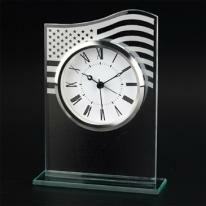 American Flag Accented Glass Alarm Clock. Size(s): 5 X 7. Imprint: 3 X 1 1/4 Additional Information: Prices include one color, one position imprint. 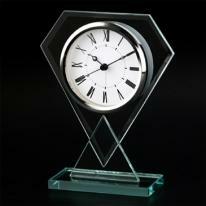 Diamond Shaped Glass Alarm Clock. Size(s): 5 1/2 X 7 Imprint: 1X 1 Additional Information: Prices include one color, one position imprint. Hotel wakeup call never came? With this travel alarm clock, relying on someone else to wake you up will be a thing of the past. 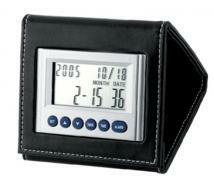 Tuck it away, or when needed, pull out this drop-down alarm clock from its black leather finished case. Finish/Material: Leatherette, Metal Dimensions: 2 1/2" W x 2 3/4" H Imprint Area: 1" W x 5/16" H Shipping Information: Carton Size: Box Length: 16.00 Box Width: 16.00 Box Height: 9.00 Standard Packaging: Individually Carton Weight: 50lbs / 100pcs. 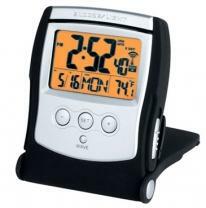 Travel alarm clock w/rotary display, date & temperature. Size(s): 2 1/2 x 4. Imprint: 1 1/2 x 1/4 Additional Information: Pricing includes one color, one position imprint. 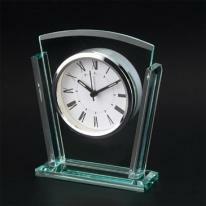 Glass Alarm Clock On Wood Base. 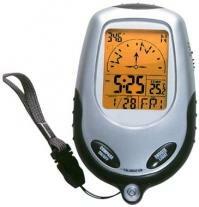 Size: 4 1/2" X 6 1/2" X 1 1/2" Imprint Area: 2" X 3/4" PCS/LB: 24/25 Battery: 1 X AA (Not Included). Glass Alarm Clock On Wooden Base. 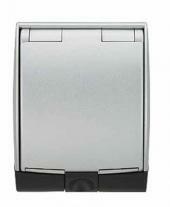 Size: 4" X 6" X 1 3/8" Imprint Area: 2 1/2" X 1/2" BASE 1 1/2" X 1" TOP PCS/LB: 24/25 BATTERY: 1 X AA (NOT INCLUDED). Foldable Traveling Alarm Clock. Size : 3 1/4" x 2 3/4" x 1" Imprint Area : Cover : 2" x 2" ; Inside : 1 1/2" x 1 1/4" PCS/LB : 100/30. 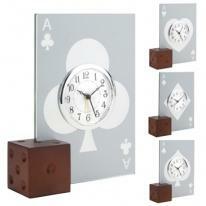 Available Ace Style : Spades, Diamond, Club & Heart Glass alarm clock with wooden dice base. 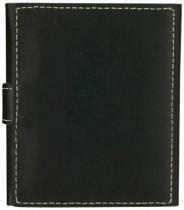 Size : 5" x 6" x 1 5/8" Imprint Area : 2 1/2" x 1" PCS/LB : 24/22. 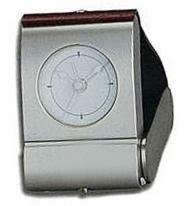 Durable and portable, this brushed silver timepiece is the perfect traveling companion! Holds a 1-1/2 diameter picture. Approximate Dimensions: 2" H x 2" W x 1" D Imprint Area: 1" H x 1" W. Other decoration methods are available for this item, please call. Weight: 0.3 lbs. 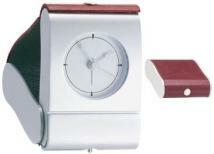 USA atomic travel alarm clock. Size(s): 2-3/4 x 3-1/2 inch. Imprint: 2 x 1 1/2 Additional Information: Pricing includes one color, one position imprint. 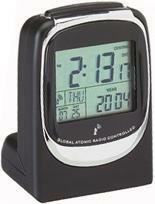 Radio Controlled Travel Atomic Alarm Clock. Size(s): 2 3/4 x 3 3/4. Imprint: 1 1/2 x 1 1/2 Additional Information: Pricing includes one color, one position imprint. 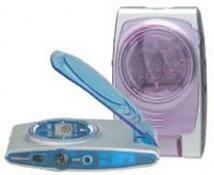 Button For Snooze & Light On/Off Switch For Light & Alarm Available In Blue, Red And Green Lighted Flash When Alarm Is On. Size : 4" X 3" X 4 1/2" Imprint Area: Top 1" X 1/4" PCS/LB: 60/33. 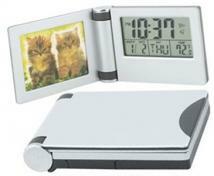 Calendar & Thermometer Foldable flip for desktop Alarm clock with Backlight Battery : 2 x AAA (Included). Size : 2 3/4" x 3 1/2" x 1" Imprint Area : 2"x 1 1/2" Inside: 1 1/2" x 3/8" PCS/LB : 100/35. Glass Clock Battery: 1 x AA (Not Included). Size : 5 1/4" x 6 1/4" x 1 1/2" Imprint Area : 2 1/2" x 1/2" PCS/LB : 24/36. Diamond Glass Clock Battery : 1 x AA (Not Included). Size : 5 1/2" x 7" x 1 3/4" Imprint Area : 1 1/2" x 1 1/2" PCS/LB : 24/25. 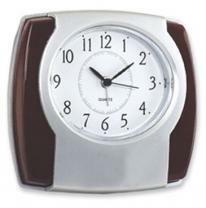 Elegant flip-open snap style polished metal and leather-tone travel alarm clock, Left side disc swivels, one side for logo, the second side for a photo insert. Item Dimension: 1 7/8"H x 1 7/8"W x 1"D Imprint Sizes: 1 1/4"H x 1 1/4"W Extra color/position imprint add 55.00 set up, plus running charge of 0.80 per piece for quantities of first two pricing columns, 0.40 per piece for quantities of last two pricing columns. Gift box and battery included. Packaging: Stand Gift Box Material: Leather & Metal Units/Weight Per Carton: 50 Pcs. / 22 Lbs. 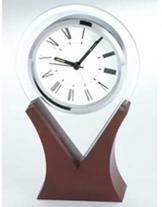 When away from home, bring along your favorite picture in this Roman numeral-faced clock and photo frame. 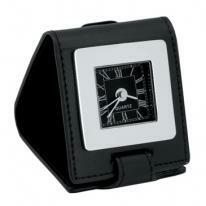 It comes in a classic, soft black case with a chrome closure and accents. Finish/Material: Leatherette Dimensions: 2 3/4" W x 3" H Imprint Area: 1" W x 3/8" H Shipping Information: Carton Size: Box Length: 17.00 Box Width: 10.00 Box Height: 10.00 Standard Packaging: Individually Carton Weight: 23lbs / 50pcs. 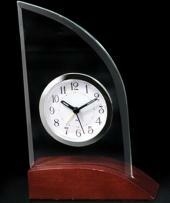 Arched Glass Alarm Clock With Wooden Base. Size(s): 4 1/2 X 6 1/2 Imprint: 2 X 3/4 Additional Information: Prices include one color, one position imprint. 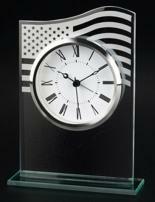 Flag Glass Clock. 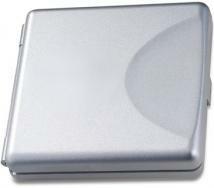 Size : 5" x 7" x 1 1/2" Imprint Area : 3" x 1 1/4" PCS/LB : 24/24 Battery : 1 x AA (Not Included). Travel Alarm Clock. Finish/Material: Leatherette, Metal Dimensions: 3" W x 3" H x 0" D Imprint Area: 1" W x 5/16" H Shipping Information: Carton Size: Box Length: 19.00 Box Width: 14.00 Box Height: 10.00 Carton Weight: 17lbs / 50pcs. 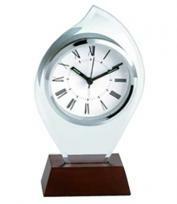 Flame Shaped Glass Alarm Clock With Wooden Base. Size(s): 4 1/2 X 6 3/4 Imprint: 2 1/4 X 1 Additional Information: Prices include one color, one position imprint. 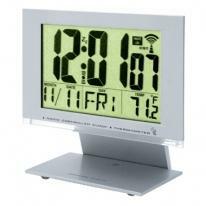 Atomic Digital Alarm Clock With Picture Frame. Size(s): 3-1/2 x 4-1/4. Imprint: 2 x 2 Additional Information: Pricing includes one color, one position imprint. 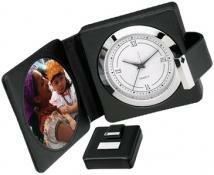 Travel clock & photo frame. Finish/Material: Leatherette, Metal Dimensions: 3.50" W x 2.00" H Imprint Area: 1.250" W x 1.250" H Shipping Information: Carton Size: Box Length: 3.50 Box Width: 2.00 Standard Packaging: Individually Carton Weight: 31lbs / 50pcs. 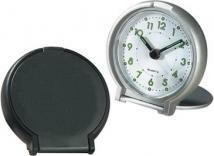 Global Travel Atomic Alarm Clock. Size(s): 2-3/4 x 3-1/2 inch. Imprint: 2 x 1 1/2 Additional Information: Pricing includes one color, one position imprint. Travel Alarm Clock. Finish/Material: Leather, Metal Dimensions: 2" W x 2 3/4" H Imprint Area: 1 1/4" W x 5/16" H Standard Packaging: Individually Carton Weight: 27lbs / 50pcs. Stand it on your desk or hang it on the wall for convenience. Allow 20 minutes for charging before the first use. 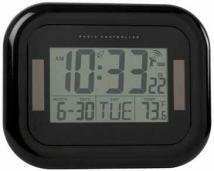 This solar powered radio controlled clock is an updated version of the atomic clock that features a 12/24 format. 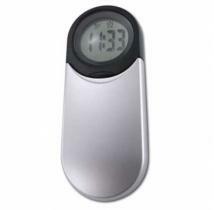 There is the option to manually set time, date and weekday display, indoor temperature in C/F, alarm and snooze function. Product Size (H x W x D): 7.00 x 9.00 x 1.00 Imprint Area: Below Display 5/8"h x 3"w Packaging: Gift Box Pieces Per Box: 20 Weight Per Piece: 1.25 lbs. Weight Per Box: 25 lbs. Case Dimensions (L x W x H): 20 x 9 x 16. 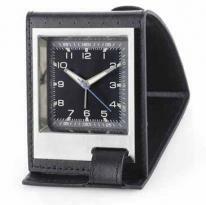 Silver metal foldable travel alarm clock with leather cover. Size(s): 2" x 3" Imprint: 1 x 3/8 Additional Information: Prices include one color, one position imprint. Global travel atomic alarm clock. Size(s): 2 5/8 x 4 1/4 Imprint: 1 1/4 x 1/4 Additional Information: Pricing includes one color, one position imprint. 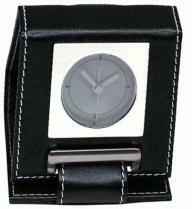 Brushed metal clock case in foldable genuine leather pouch fits 2-2" x 3" photos. Finish/Material: Leather, Metal Dimensions: 3 1/2" W x 4" H x 1" D Imprint Area: 1 1/2" W x 1/4" H Shipping Information: Carton Size: Box Length: 17.00 Box Width: 11.00 Box Height: 10.00 Standard Packaging: Individually Carton Weight: 24lbs / 50pcs. 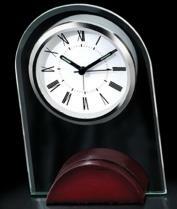 Time will be on your side no matter where you travel with this sleek chrome world time clock. 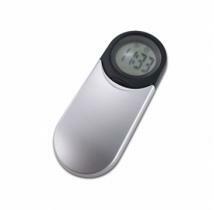 Small enough to slip in your pocket, this clock covers 24 times zones, has an alarm function and a black protective case. Finish/Material: Metal Dimensions: 2 3/4" W x 3" H Imprint Area: 1" W x 1/2" H Shipping Information: Carton Size:10" W x 7" H x 16" L Standard Packaging: Individually Carton Weight: 25lbs / 50pcs. 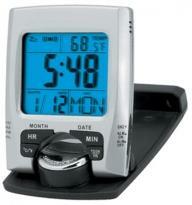 Alarm clock with backlight Calendar & thermometer Adjustable viewing angle. Size : 6 3/4" x 6 1/2" x 3 3/4" Imprint Area : 4" x 3/8" PCS/LB : 20/22. The perfect travel clock! 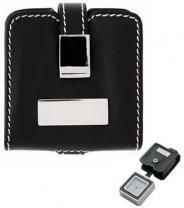 Fits neatly and compactly into briefcase or purse. Get a lot of mileage out of this timepiece! Approximate Dimensions: 3" H x 2.75" W x 3.75" D Imprint Area: 0.25" H x 1" W. Other decoration methods are available for this item, please call. Weight: 0.24 lbs. High accuracy Japanese Quartz movement. Heavy desktop or mantle essential. Translucent acrylic face with brushed steel rim accent. Folds up for compact travel. 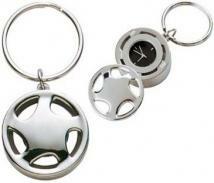 Product Size: Item/Flat: 5"" Diameter x 7/8"" Thickness. Item/Stand: 5""W x 4-7/8""H x 5-1/2"" D Imprint Area: Silkscreen 1-1/2"Diam / Engraved 1-1/4"Diam Note: Price includes one color/one position silkscreen imprint Screen charge: $50 per color/position/style Less than minimum: add $75 per color/position/style For additional run charges and imprint details, call for info. Weight: 24pcs / 22lbs. 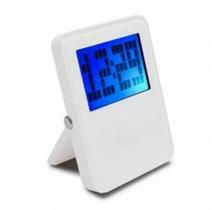 Liquid crystal display Alarm clock (12/24 hrs) Snooze / light function Date and day display Thermometer (F or C) EL backlight Neck strip and key holder included for easy carrying. Size: 2 3/4" X 1 1/4" X 4 3/4" Imprint Area: 1/2" X 1/2" PCS/LB: 50/28 Battery: 3 X AAA (Included). Etched acrylic world map that glows with 5 colors On/off light switch Large LCD display Customize your own acrylic plate Size : 7 1/4"w x 4 1/4"h including plate Note: Pl-8175 Base, sold separately Packaging, Standard : Gift Box Shipping info: 20 pieces per carton, 30 lbs per carton, carton size 10.00" x 18.00" x 14.00".